Sometimes when I feel the need to get an overview of something, I draw a mind map. Yesterday I announced my intention to do just that when Abby said: "I can do mind maps!". 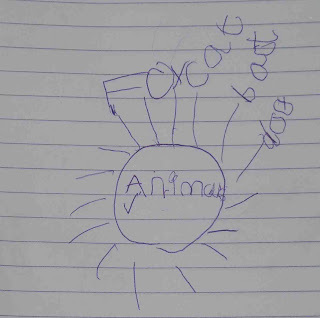 She proceeded to do this animal themed map in my notebook. I feel very proud and old, at the same time. I was 20 when I first read about mind maps. Hey - that's the Flying Spaghetti Monster. *Smart* girl!